Traditional cottage in the country in central Scotland. 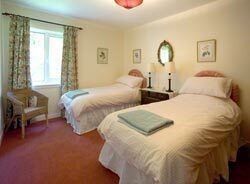 Self-catering rental accommodation sleeping 5 to 6. Balgonar is a small country estate and family-run farm set amongst the woods and fields and rolling hills a few miles north of the Firth of Forth in central Scotland. Owners Libby and George Elles used to live in this cottage which was originally built in Victorian times for the estate chaufeur. It is now available for self catering as a holiday cottage - a secluded and tranquil place but incredibly central for exploring Central Scotland. The West coast, Glasgow, Edinburgh and St Andrews on the East coast are easily accessible, and Stirling which some say is the centre of Scotland is only 30 minutes away. Children will love it here. The Elles have their own free range chickens, cattle, sheep and pigs, and can supply eggs, home-cured bacon and meat as well as fruit and vegetables from the walled garden in season. A hundred yards away they have further self catering accommodation, a converted bothy which sleeps 2 to 4, so you can combine the two if you are a large family or party of friends. 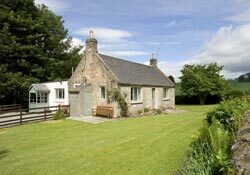 See Balgonar Bothy. 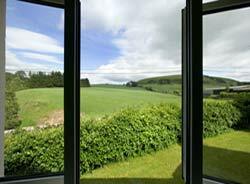 Above left; The view from the Double bedroom window. 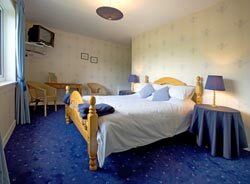 Above right; King-sized bed in the Double bedroom. TV/VCR. Right; Bathroom. 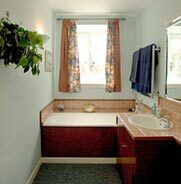 Old fashioned bath with shower attachment, basin and wc. 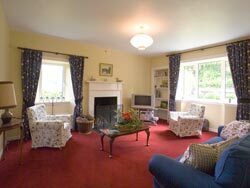 Plenty of space in the Sitting room which has a log fire, television, VCR, DVD, CD, tapeplayer and radio. 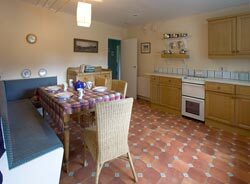 The cottage has central heating and is double glazed throughout. Dining, table benches and chairs for 6. Oven, hob, food processor, coffee maker, pasta maker, fridge freezer, washing machine and tumble dryer. There's also a walk-in larder. 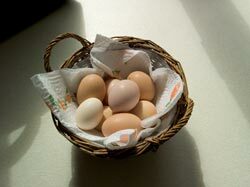 Ask Libby about her home-produced bacon, meat, free-range eggs and fruit and vegetables. 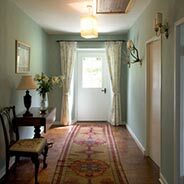 Short breaks , minimum let 3 nights, please enquire for availability and prices. 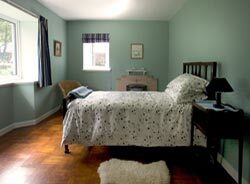 Above prices reduced by 10% for 2 person occupancy or two week booking at certain times. Prices include: linen, firewood, heating oil and electricity. 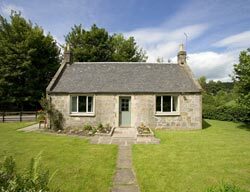 ★ See also the Elles's other self catering accommodation: Balgonar Bothy - a modernised studio hideway converted from an old stone barn, ideal for 2 though would sleep 4. Please tell Libby and George you found Balgonar Cottage About Scotland!